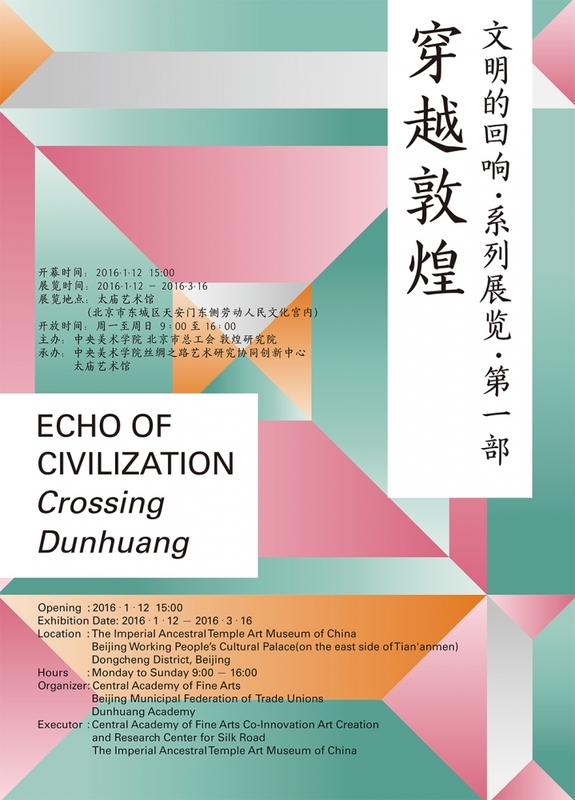 On the afternoon of January 12th, 2016, the grand exhibition of “ECHO OF CIVILIZATION: Crossing Dunhuang” was inaugurated at the magnificent Ancestral Temple. This is an exhibition which originates from “Dunhuang”, showcasing and implementing aesthetics feast of modern and contemporary art creations. It is the responses from generations of art masters to the traditional art of Dunhuang, and it is also the modern echo to the Chinese traditional civilizations over thousands of years. The exhibition is co-organized by the Central Academy of Fine Arts(abbr. CAFA), Beijing Municipal Federation of Trade Unions and Dunhuang Academy. It is held by the Central Academy of Fine Arts Co-Innovation Art Creation and Research Center for Silk Road and The Imperial Ancestral Temple Museum of China. With Fan Di’an, President of CAFA serves as the chief curator of the exhibition, it invites a great number of outstanding artist to present their masterpieces of contemporary art copying from the classical works of Dunhuang or their transcribing works collected by the Dunhuang Academy and the CAFA Art Museum. With over 300 pieces/groups of art works in various forms, it initiates the art journey centering around the art of Dunhuang and the civilization of the Silk Road which transcending the ancient and the contemporary. The exhibition is both a microcosm of the great beauty of Dunhuang, for visitors can catch sight of the rich appearances of Dunhuang art from their copying works; also the exhibition is the further extension of this beauty as the audience can find the creative states that generations of fine arts masters have been inspired from them. This exhibition will continue to March 16, and it will span the period of Chinese Spring Festival. This exhibition can be taken as a gift of new spring presented by the Central Academy of Fine Arts in collaboration with the Ancestral Temple. It is unnecessary for the visitors to take a trip over thousands of miles westbound since they can experience the “beauty of Dunhuang” at the Ancestral Temple with the classical beauty. The Vice-chairman, Secretary, and Party Member of the Chinese Federation of Literature and Art Circles, Zuo Zhongyi, the Chief of Gansu Provincial Bureau of Cultural Relics Ma Yuping, the Honorary President of Dunhuang Academy Fan Jinshi, Prof. Jin Zhilin from the Central Academy of Fine Arts, former president of the previous Central Institute of Crafts and Arts Chang Saone Chang, Party Secretary of the CAFA Party Committee Gao Hong, President of the Central Academy of Fine Arts and Vice Chairman of the Chinese Artists’ Association Fan Di’an, Party Secretary of the Beijing Municipal Federation of Trade Unions and Vice President Zeng Fanxin, Party Member and Deputy Secretary of the Beijing Municipal Federation of Trade Unions and Deputy Secretary Han Shichun, Deputy Secretary of the Section of Party Committee in the Chinese Artists’ Association and Secretary in Chief Xu Li, the Deputy Inspector of the Gansu Provincial Department of Culture Wang Chunsheng, Deputy Secretary of CAFA Party Committee Wang Shaojun, Deputy Director of the National Art Museum of China An Yuanyuan, the Assistant to the CAFA President Wang Xiaolin and Lu Bin, as well as related leaders from the system of Beijing Municipal Federation of Trade Unions, artists and media reporters gathered at Tiao Palace of the Ancestral Temple, to witness the grand opening of “ECHO OF CIVILIZATION: Crossing Dunhuang”. The beauty of Dunhuang is not reflected on the visual images, but it is also contained in the traditional musics, dances, rituals, religions and ideological cultures. The opening ceremony for the exhibition was presented from a unique perspective, with a multi-disciplinary show rich in gorgeously visual effects, it presented the aesthetics of Duhuang to unveil the artistic vision of “Dunhuang” crossing the ancient and the contemporary. “Boundless Fall of Flowers like Rain, With the Loud and Jarring Performance of Heavenly Music”, the dances of flying Apsaras, were performed lightly as if beyond the highest heavens, this is the world of flying Apsaras in Dunhuang. Meanwhile, this image of “Flying Apsaras” has been integrated into the traditional Chinese dancing performance, which reflects the prosperity of great China. At the opening of this exhibition, the Art Troupe of Beijing Municipal Federation of Trade Unions, brought their dance “National Beauty and Heavenly Fragrance” to reproduce the dances and costumes of “Flying Apsaras” and they realized the transformation of the artistic image from the two-dimensional to the three-dimensional. Being one of the trans-boundary artists who attended this exhibition, Tan Dun presented his unique musical creation in the form of multimedia, in his work the round score represents the “Buddha”, as it embodies the Oriental music, religion and culture, while the crucial score represents “Jesus”, as it embodies the Western music, religion and culture. Both of them stands for the two opposite ends of the Silk Road, and they are connected to the central with “voice”, thus a map of sounds is formed. It implies the integration of civilizations on the Silk road. Dunhuang does not only influence generations of painters, but designers also draw inspirations from it and they have created a large number of works with the beauty of Chinese characteristics. On the opening ceremony, fashion designer Lv Yue and Chu Yan showcased their fashion design respectively, their works are endowed with aesthetic characteristics from both traditional Chinese clothing and contemporary costume. The exhibition opened the grand chapters of Dunhuang with a magnificent prelude, and “ECHO OF CIVILIZATIONS” sustains the art history context of Dunhuang.